Welcome to Wilkes Pied-a-terre! Spacious front living quarters. There is a flat screen television located in the antique armoire. Relax your day away. Comfortable seating for all. The dining room opens up to the living room. Plenty of seating for morning breakfast. Luxuriously decorated with antique pieces. Make your morning coffee or breakfast here. Sleep the night away in this king size bed. Storage and a reading chair to cuddle up in. The fire place is original to this home built in 1869. View into the dining room. Get ready in the morning at the built in vanity. 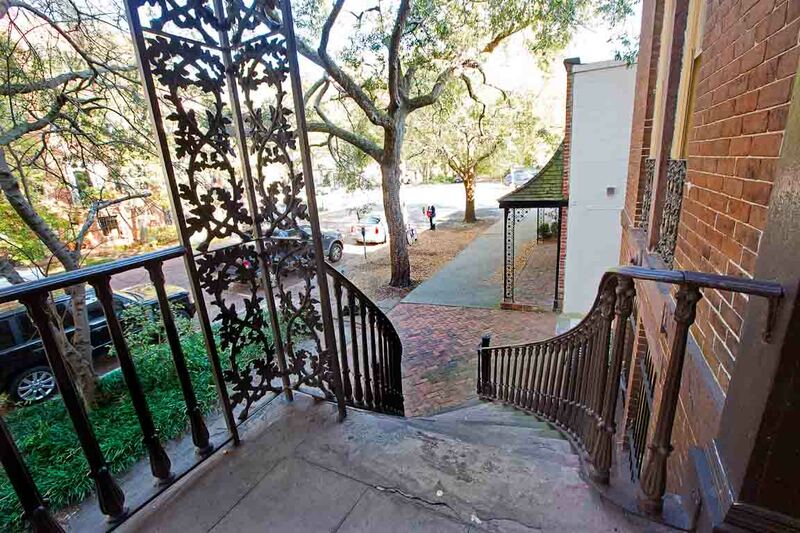 A charming stroll on historic Jones Street awaits. Step on in to comfort! Lovely historical staircase leading up to the home. Guests receive two complimentary lunch tickets to Mrs. Wilkes. 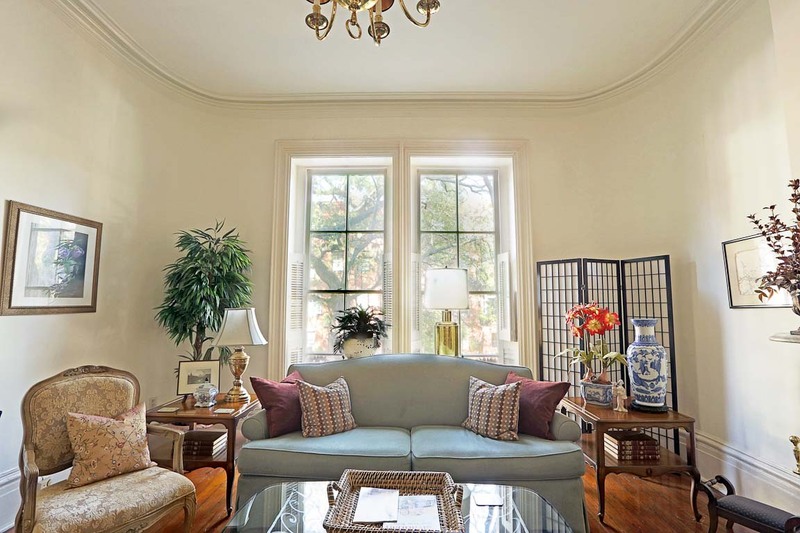 Rich in architectural details, this home has original hardwood floors, marble fireplaces, and 12’ ceilings complimented by stately furnishings. Enjoy a view of Jones Street from the comfort of your living room, where a flat screen TV is discreetly tucked away in the armoire. 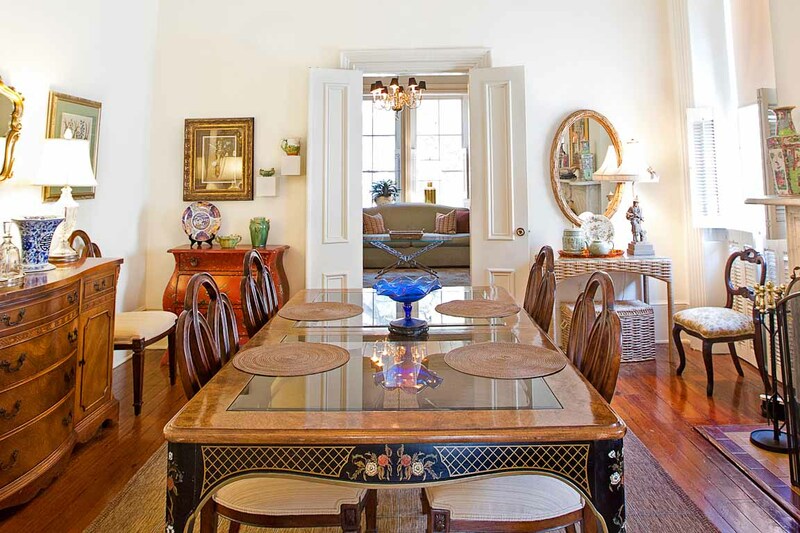 The connecting dining room has lots of light and beautiful antique furniture. The recently renovated kitchen is fully equipped with all you’ll need for a weekend getaway or extended stay, including a washer and dryer. The bedroom has a stately four-poster king-sized bed, reading chair, and plenty of drawer and closet space to unpack and settle in. The ensuite bathroom has a bright, walk-in shower and a large vanity with space to sit and get ready for your day or a night out. A walk down nearby Whitaker Street will bring you to several locally owned shops, including One Fish Two Fish, Number Four Eleven, and Lily Bay Studio + Bazaar. With a three night or longer say, you’ll receive one free lunch for two at Mrs. Wilkes’ Dining Room, where you’ll dine like a local and feel like family! - Take a leisurely morning stroll through nearby Forsyth Park, Savannah’s largest green space and a popular location for weddings and festivals. - A small patio in the back is the perfect spot to enjoy a fine Savannah morning and cup of coffee. - The bedroom has a small desk, perfect for getting some work done or just planning your day. *Guests receive one free lunch for two with every three-night booking. Please contact the Mrs. Wilkes Restaurant directly regarding seasonal hours. Within moments of walking in and seeing the high ceilings, eclectic antiques and accents, and that old home smell, I was back a my grandmothers home. Warm, safe, and wonderful. What a great experience. The folks are Lucky Savannah were terrific, because we stayed at Mrs. Wilkes house they helped with getting us into Mrs. Wilkes restaurant and we met Mrs Wilkes granddaughter, which was a treat. Great experience! We loved the place. Beautiful furnishings. We will return to stay here. My sister and I absolutely loved our stay at Wilkes Pied-a-terre. We were blown away by the size, aesthetic and convenience of its location where so much was within walking distance. Such thought went into every design choice in this quaint mini-apartment! It was worth the price - especially with the complimentary lunch at the famed Mrs. Wilkes Dining Room, where you have the total luxury of skipping the long line out front if you call ahead. Our only complaint is that the room itself was a huge challenge to get into the first night we arrived. We spent a good 30 minutes searching for the correct entrance and lockbox, and Lucky Savannah texted and emailed the wrong keypad code, so I had to locate it in the app, where it was buried at the bottom and easy to miss. Definitely download the app ahead of time, as that may save you some trouble. Super easy check-out process, though, and overall we would definitely recommend it to anyone visiting Savannah! We had a very nice stay. And we enjoyed the free meal, as well. The experience with Lucky Savannah from selecting our place to stay, through our stay and at check out was seamless and pleasant. Thank you to all the folks at Lucky Savannah that made our stay at the Wilkes-Pied-a-terre truly a unique experience. Hi Hank! Thanks again for choosing Lucky Savannah. We couldn't be more pleased with your feedback, and look forward to hosting you again soon! This was a beautiful unit and a great location to walk everywhere. Easy to access unit and the Lucky Savannah App provided great information. Kathy, thank you again for choosing Lucky Savannah! We look forward to hosting you again soon. I love this vacation rental I can't wait to come back the only thing I found disappointing was the stove it was in pretty bad shape I definitely would not feel safe using it. Other than that the apartment was just beautiful and peaceful at night time the sound of the kitchen below in the morning didn't bother me because it was not till around 9 or 10 that it started and it is simply expected being located above Mrs Wilkes restaurant.And even then I was out of the house by that time. The restaurant is closed on the weekends. Parking was easy as I bought a daily permit from the Savannah Visitor Center what's really was not expensive at all. I got to meet the owner and she was lovely and welcoming. Angela, thank you again for choosing to stay with Lucky Savannah! We're so happy to hear that you enjoyed Wilkes Pied-a-terre and look forward to hosting you again soon! Beautiful and roomy, great location above Mrs. Wilkes restaurant. One note bring water for coffee / drinking etc. The water supply has a strong sulfur smell and was tolerable for the shower but not cooking. We had read this in a previous review also. Lunch at Mrs. Wilkes was great and you get to avoid the line! Overall a wonderful experience. James, thank you for choosing Lucky Savannah! We're so happy to hear that you enjoyed your stay at Wilkes Pied-a-terre. Savannah's water can seem sulfurous to some but is completely safe to consume. We look forward to hosting you again soon! We stay busy in the city trying to see all we could and experience all we could. It was always a joy and a comfort to return to Jones Street where we were staying. For location of our rental property was above Mrs. Wilkes dining room. We actually enjoyed that, hearing the people come into work and knowing they were getting ready for that famous Mrs. Wilkes meal. Hi Patricia and Richard! Thank you for choosing Lucky Savannah. We are so glad that you enjoyed your rental and your overall stay with us. We hope to see you again soon! This was a lovely well appointed apartment with all the things you would need for a relaxing time. Lucky Savannah managers Jade in particular, were wonderful and dealt with all requests. We were well cared for. Hi Paul! We are so glad you enjoyed your rental and your time with us. Also, thank you for letting us know that Jade offered you the best service possible and you felt cared for. We hope you come back and see us again! Really enjoyed the clean,beautiful apartment. Location couldn't have been better for easy walking, taking the DOT, eating. Amanda was terrific. Only negatives were the very noisy mattress which crackled and popped with every movement, and the noise level on weekday mornings with trash pickup very early and Monday morning very early cooks downstairs prepping. Obviously neither can be avoided. We are early risers but the noises were very loud much before sunrise. Aside from that, we very much enjoyed our stay. Hi Bob! Thank you for choosing Lucky Savannah! We're so glad you enjoyed the location, cleanliness, and beauty of your rental. Also, thank you for letting us know that Amanda provided you with excellent service! We know that noise is apart of city accommodations. However, our sales team is always available to assist you in offering rentals in areas that minimize that and meet your needs. We hope to see you again soon, and give us a call so we can place you in a unit best for you! Anthony, thank you for choosing to stay with us at Lucky Savannah! It's wonderful to see you enjoyed the decor of the rental and it's great location. In regards to the internet, please know that we offer a 24/7 Guest Line that is always available to walk you through and resolve any issues you may be encountering. We would have loved the opportunity to resolve this matter while you were still in the unit, had we been made aware. Please remember that we are always available to assist to ensure your stay is nothing short of memorable for all the right reasons. Also, our sales team would love the opportunity to recommend properties with updated kitchens that match your desires! You are privy to our Return Guest Discount, and what better way to use that than allowing us to get you set up with the unit perfect for you? We hope to host you again soon! It was very enjoyable and would love to come back and stay in the same place. The weather was great and everything was close by. We had a great time. We stayed 4 days and 3 nights. was lovely pied-a-terre. perfect location. beautiful lunch experience..thank you marsha!! & all of you lovely servers downstairs..;) a most special birthday celebration for my boyfriend & a most southern charming getaway for the both of us. Best vacation in Savannah yet!!! We have been coming to Savannah on vacation for several years now. We typically stay on Tybee, but decided to stay in the downtown historic district this time. What a great choice!!! The home was very clean and well maintained. Waking up in the mornings to the smells coming from Mrs. Wilkes Dining Room right below us was amazing! The pass for dinner that was included in the rental was an extra bonus. We honestly felt like VIP's getting to go through the kitchen and not having to wait in line. We will definetely be beack next year AND will eat at Mrs. Wilkes every time we come to Savannah!! Lucky Savannah Vacation Rentals was the best vacation company we have ever dealt with and we would highly recommend them to anyone!!! Very much enjoyed our stay here. Close to everything which makes walking to what ever we want to see and do very convenient. It was very quiet and very private, perfect for us. Certainly had a "Savannah" feel, we would definitely stay here again. We loved Wilkes Pied-a-terre. Beautifully decorated. Very comfortable. We loved eating at Mrs. Wilkes. My only regret is that we couldn't stay longer. Management was very kind and responsive. The app was wonderful! Hi Daniel! Thank you so much again for choosing to stay with us. We're so glad to hear you enjoyed your stay at Wilkes Pied-a-terre as well as our local cuisine. Please know that you're privy to our Friends and Family discount next time you stay with us. Looking forward to hosting you again soon! Great location and loved the decor an ambiance of staying in a period style home above a great restaurant. 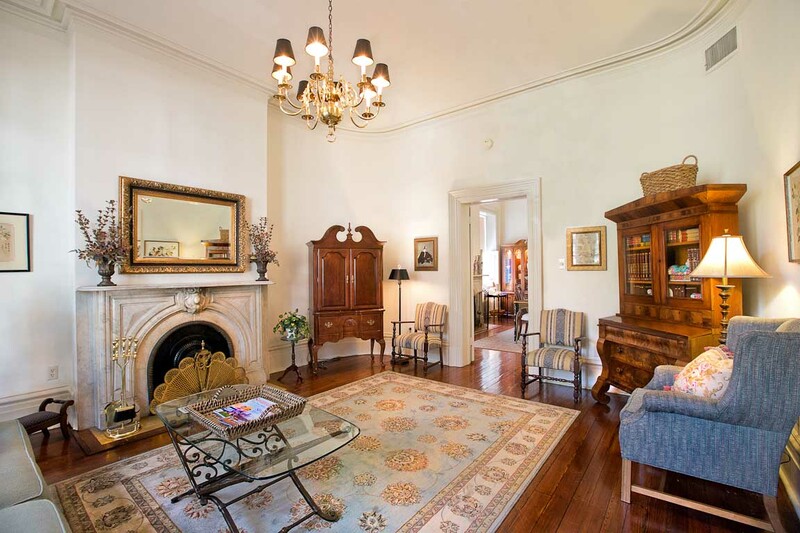 Wilkes Pied-a-terre is a wonderful location from which to see Savannah! 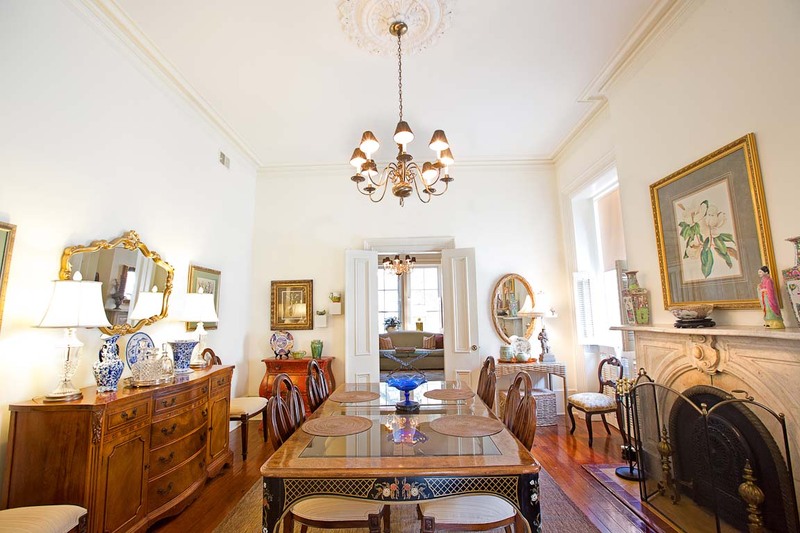 The property is beautiful and within walking distance of so many places you want to see in Savannah. After staying at Mrs. Wilkes on my previous trip to Savannah, I chose Mrs. Wilkes Pied-a-terra this time and was not disappointed. Hi Shana! Thank you so much again for choosing to stay with us. We're so glad to hear you enjoyed the Wilkes Pied-a-terre and look forward to hosting you again soon! Hi Srinivas! Thank you so much again for choosing to stay with us. We're so glad to hear you enjoyed Wilkes Pied-a-terre and look forward to hosting you again soon! 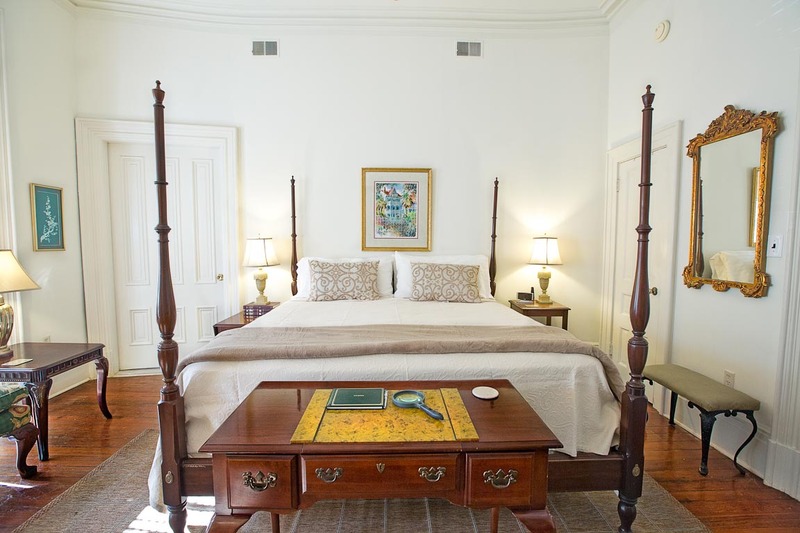 Our first visit to Savannah was even more exciting because of our stay at Wilkes Pied a Terre. The property was much more than we expected. We felt surrounded by history in this quiet, comfortable, well maintained property that was within walking distance to everything. Once we unloaded our car we never moved it until we left 3 days later. This will be our place to stay if we return to Savannah. An extra gift was entering through the back door to enjoy lunch at Mrs. Wilkes Kitchen. We highly recommend this property. Hi Raymond! Thank you so much again for choosing to stay with us. We're so glad to hear you enjoyed Wilkes Pied-a-terre and the delicious restaurant below. Please know that you're privy to our Friends and Family discount next time you stay with us. Looking forward to hosting you again soon! We did have a wonderful stay in Savannah. There were several items that needed attention at the property. The bathroom sink drain works very slowly. The middle light over the bathroom sink is out and needs replacing. We were only given 2 bath towels, 2 washcloths and 1 hand towel. It would have been nice to have 2 hand towels. There was no kitchen dishtowel. It was very nice to have a washer/dryer and dishwasher. Hi Norma! Thank you for choosing to stay at Wilkes Pied-a-terre; we're so glad you had a wonderful time in Savannah. Next time you stay with us, please be sure to call Guest Services so that we can run extra supplies and address any maintenance issues at once - we're happy to help! Looking forward to hosting you again soon. I loved this property- it was beautiful and perfectly located. My only gripe, however, ( and it's a big one) is the security lights across the back of the property. The bedroom was lit up like daytime, and I am a person who needs the room very dark to sleep well. The curtains did nothing to block the light. Otherwise, we had a lovely time.... a very tired, but lovely time. Hi Holle! Thank you for choosing to stay at Wilkes Pied-a-terre. We'll be sure to forward along your suggestions to make future stays more comfortable. Please know you're privy to a Return Guest Discount next time you stay with us. This was our second visit to Savannah, and our second stay at this property. We really like the location, and being able to have lunch at Mrs. Wilkes! It is a nice property, but it could use updates in the kitchen and bathroom, and both of those rooms could be cleaner. Overall, we love Savannah. Hi Roger! Thank you for returning back to Lucky Savannah and Wilkes Pied-a-terre. We're grateful for your feedback and look forward to hosting you again soon! We absolutely loved our stay at the Wilkes Pied-a-terre. The location was perfect and within walking distance to pretty much everything on our "to see" list. We downloaded the lucky savannah app and it was wonderful to have. Staying at this rental made us feel like a local. You can not ask for a better place to stay. we will definitely be back and hopefully we will have time to enjoy a lunch at the Wilkes Restaurant. The unit was very clean and very accommodating. Thanks Savannah for the memories. Thank you again for staying with us, Brandy! We're so glad to hear that the home and our guest app helped make your time in Savannah truly memorable. We look forward to your return! This was our third extended stay at the Wilkes Pied-a-Terre and we are already booked again for next year. The apartment is perfect for us. Tastefully decorated in period style with 12 foot ceilings in the heart of the historic district, it could not get any better. Over the course of a two month stay we had one minor issue with the property and it was completely solved within the hour of our email to Lucky Savannah. The home really is a treasure and we feel privileged to be able to share it each winter. 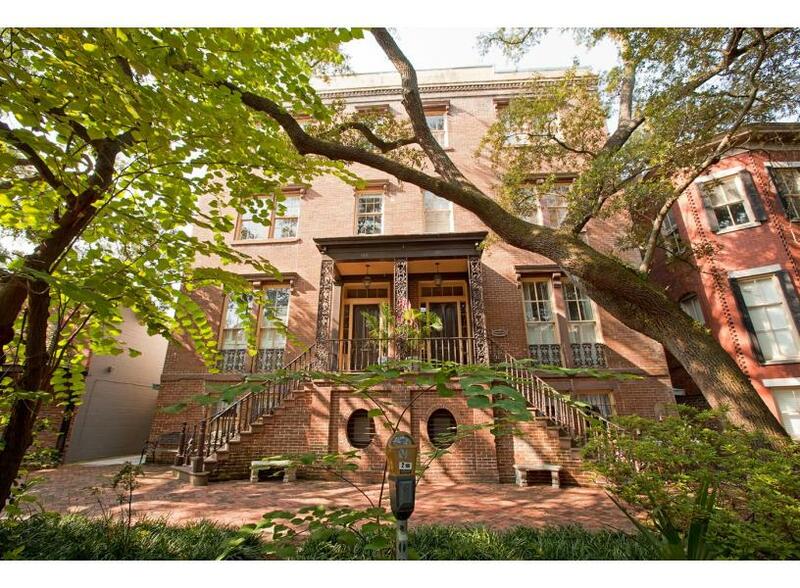 For any couple wanting to experience the authentic feel of historic Savannah, this place is perfect. This apartment is in a great quiet location, very easy walk to town. My birthday trip to Savannah was amazing; we stayed from March 19-March 22, 2015. 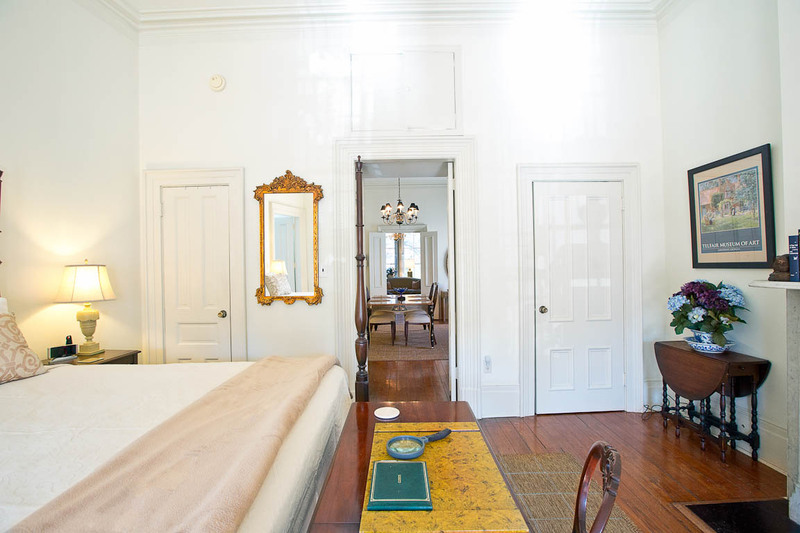 I loved the Wilkes Pied-a-terre, it represents the charm of Savannah, exactly what I was looking for. The home is beautiful; I appreciated the architectural, the warmth, and the character of the home. 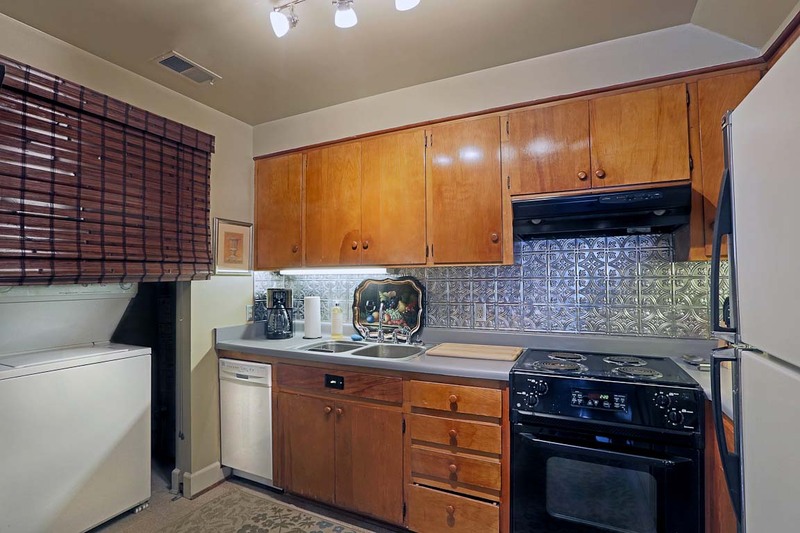 Being on West Jones St is a beautiful location of the Historical District and it is perfect, everything is in walking distance to the Forsyth Park, museums, the squares, downtown, city market, and to the river. Even trolleys and bus stops were just on the corner. The lunch at The Wilkes House was delicious, the staff was very thoughtful and treated me like family, and they celebrated my birthday with me and sang Happy Birthday. We were amazed of the homes that were built in the 1800s. The breakfast at Clary’s is huge and the fried green tomatoes at the Crystal Beer Parlor were yummy. The Forsyth Park is a Must-See. The city market is just what you need for music, food, sweets, and shopping. We did a Haunting tour, which we learned a lot. On my actual birthday March 21 my friend surprised me with a birthday package on the lunch cruise on the Savannah Riverboat, the lunch buffet was great. Looking at the old buildings from the Riverboat blew me away. 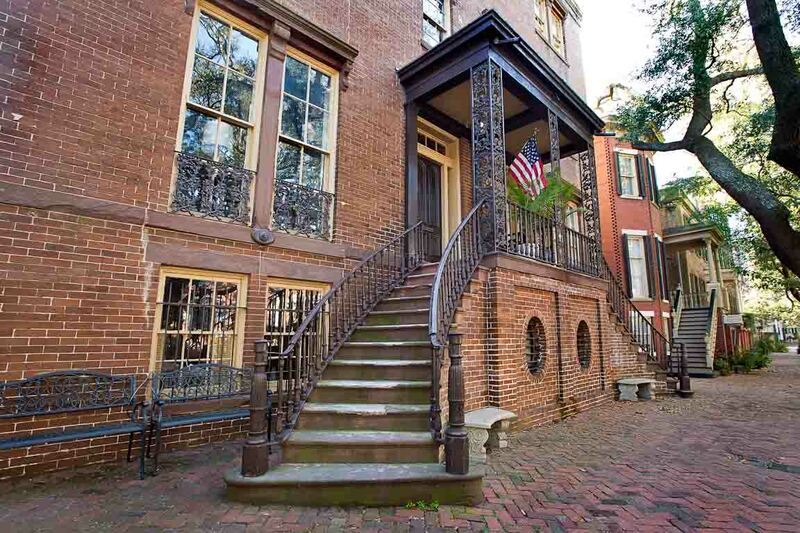 Savannah is a very charming and historical city to visit. Lucky Savannah was very accommodating with the services we needed from where to eat, shop, and even gave me a list of antiques shops to check out and very helpful when I checked in and when I checked out of the home. Thank you Lucky Savannah on everything you did for me to have a pleasurable and enjoyable birthday trip. I would definitely come back again to Savannah and stay at the Wilkes Pied-a-terre. The home is a very peaceful and soothing place to be. We have been travelling to Savannah for the past five years and have stayed in this property for the last 4. 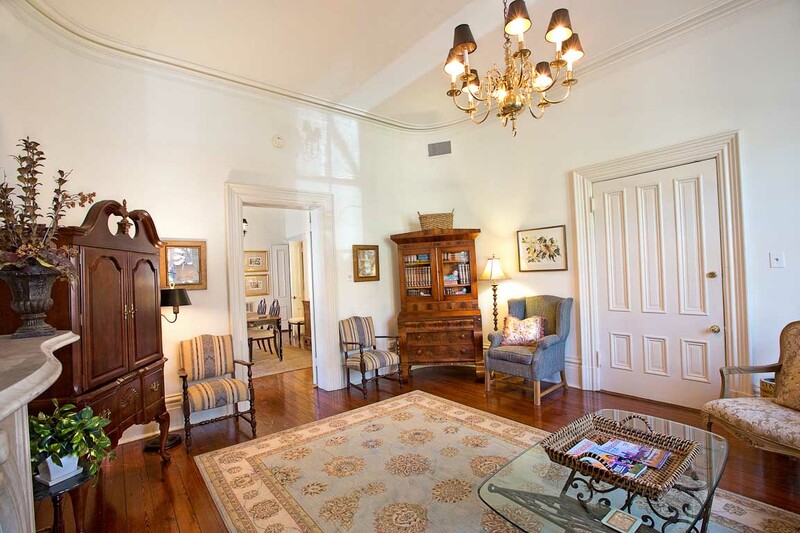 It is a well appointed, large, comfortable accommodation in the heart of the historic district and within walking distance of everything we needed for our 2 month stay. Jones Street is certainly one of the most beautiful in Savannah. We have already booked again for 2017. Thank you for choosing to stay with Lucky Savannah! What a great idea, Savannah is the perfect place to take a vacation and just enjoy the warm weather. 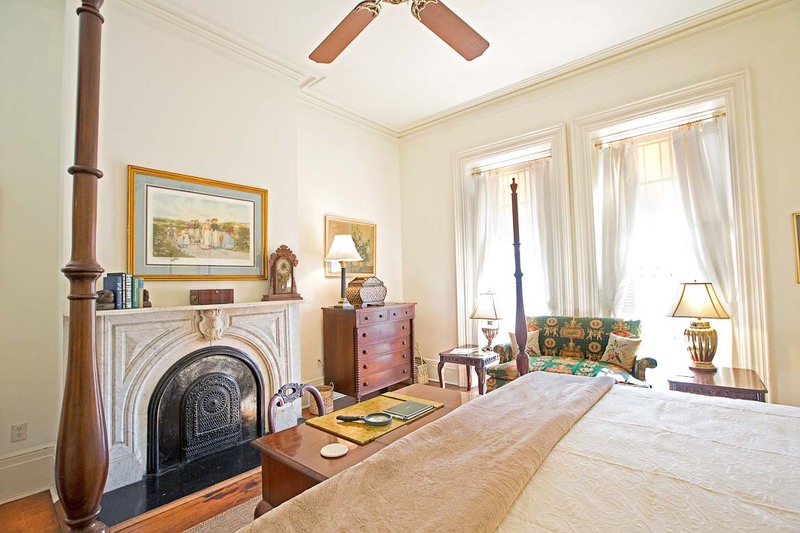 Wilkes-Pied-a-terre offers a great amount of historic charm and character! We can't wait to have you all again next year, and hopefully many more to come. Lucky Savannah staff was excellent in attempting to accommodate all our requests. The house was perfectly situated within walking distance of every part of the historic area and just a couple of blocks from any bus/trolley stop. The "worst" part of our stay was waking each weekday to the irresistible aromas of freshly-baked biscuits and signature dishes from Mrs. Wilkes' Restaurant on the ground floor below us; the special 'back-door' entry to the restaurant was worth the stay! Everything was as described - watch out for the money-hungry meter police though (buy a parking pass at the Visitor Center). Wonderful experience, clean, no check in or out, great location, lunch @ Mrs. Wilkes was a plus. Excellent experience! The property was close to everything ... no need to pay for parking; just a 10 minute walk to River Street and all the shops and restaurants. Mrs. Wilkes is a dining must when visiting! Management company was friendly and responsive. We stayed at this rental property last week. We really enjoyed the apartment above Mrs. Wilkes restaurant. It is a beautiful apartment in a perfect location! Makes it easy to walk around easily and get almost anywhere we wanted to go. Bed is very comfortable. 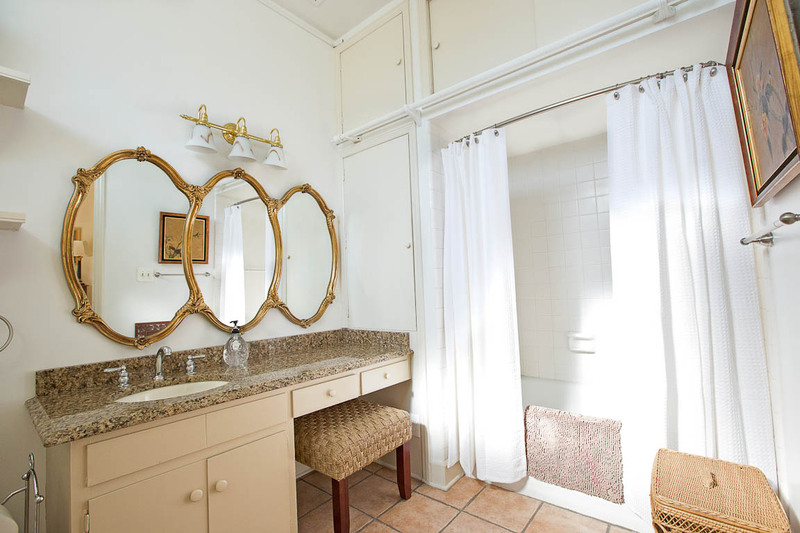 The bathroom is large and well lit, and has a door leading out the back which takes you to Mrs. Wilkes restaurant. The smell of cooking as you start your day is wonderful! The dining room table is large and comfortable. The living room is very pretty and has a TV if you want to watch something. The outside front door was difficult to open, but we finally got the hang of it. 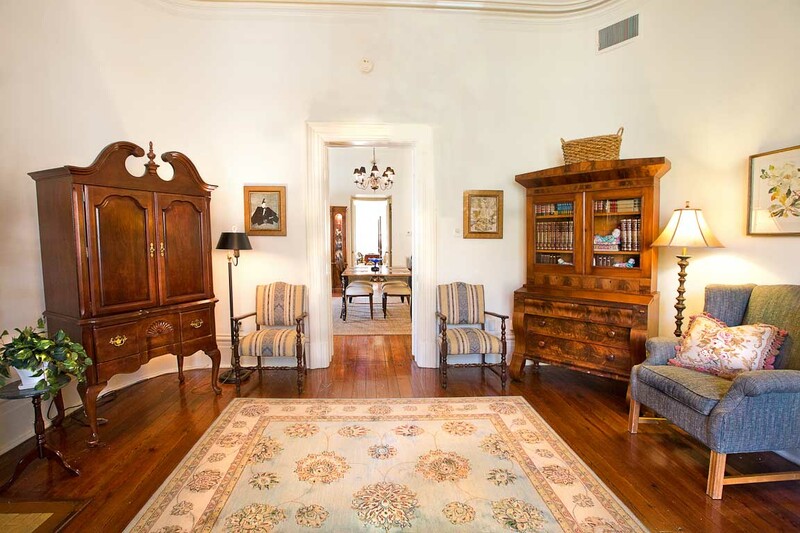 Lovely apartment in the historic district. We could walk to restaurants, churches, the waterfront, and several historic houses. Walking much better than finding parking. Property in a good location. Stayed for two weeks and other than a parking ticket had a very nice visit. Beware if you arrive on a Saturday check the street signs on street cleaning. Also the visitor parking pass is a great idea. You can buy them at the visitor center. Savannah is a beautiful city and I love visiting. Thank you for staying with Lucky Savannah! We are so happy to hear you had a great time here in Savannah! We hope you stay with Lucky Savannah again, in the near future. A beautiful place in a great location. Ive always wanted to stay in one of these beautiful places and this more than met my expectations! The food at Mrs.Wilks restaurant was delicious! What a great experience all around! Thank you for staying with Lucky Savannah! We are so glad to hear you all enjoyed Wilkes Pied-a-terre! 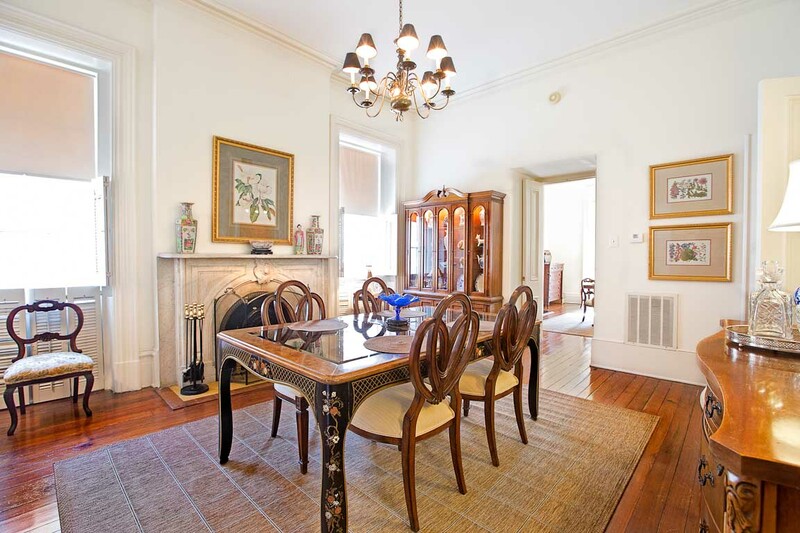 The location of this home is fantastic, located on one of the most popular streets in Savannah! That back door access for Mrs. Wilkes Dining Room really makes the experience better. We hope to have you all as our guests again, in the near future. We celebrated our 35th wedding anniversary staying here, a perfect choice. The apartment felt like we were living the Savannah life style- traditional, comfortable, accessible to the historical area by foot, and a classic southern meal at Mrs Wilkes. What more could we ask? We have already been recommending it to others. With in a 5 min safe walk were historic squares, small shops, fountains, places to eat, and historic homes and gardens. Within a 15 min, easy, safe walk was the entire historic district. We never moved our car. We will visit again. Thank you for choosing to stay at Wilkes Pied-a-terre! We are so glad to hear this was the best trip you all have had. We are happy we were able to share this home with you all! We very much enjoyed the attention to detail with the décor and housekeeping. Very clean, large comfortable space and great location. Thank you for choosing to stay with Lucky Savannah! We appreciate when guests recognize the detail we put into our homes. Wilkes Pied-a-terre is located in a fantastic location, within walking distance to many great attractions! We are delighted to hear you all enjoyed your stay. One of the best vacations we've had. The property was exactly as described, clean and well-maintained. The owners were fabulous and the food at Mrs. Wilkes was excellent. We would recommend this property to anyone and we have! Savannah has such a great southern charm and it is absolutely beautiful. We enjoyed our time at Tybee Island as well. The sunsets were gorgeous! We ate at the Olde Pink House was one of many places we ate, but reserved this restaurant for our 20th anniversary dinner. It was well worth every dime. We can't wait to make plans for a return trip to see all of the things we didn't have time for. The one and only issue we had with our stay was the king size bed in our rental. It was VERY noisy-it creaked anytime you made a movement. Thank you for choosing to stay with Lucky Savannah! We are so ecstatic to hear you all enjoyed your stay at the Wilkes Pied-a-terre. We are so glad the home was clean upon your arrival as well. Our team is glad we were able to host you, for this special time! We can't wait to have you all as our guests again soon. Please don't forget about our 10% "Returning Guest" discount! 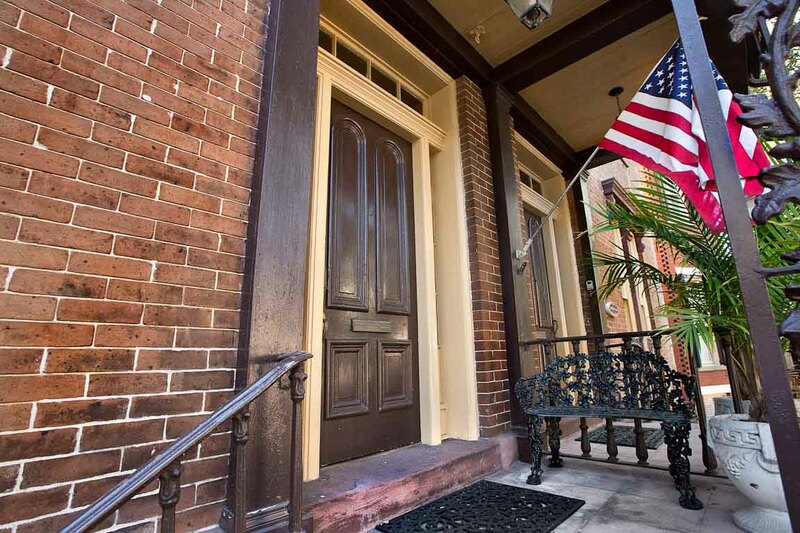 Always stay at Wilkes House in the Historic District. Never disappointed. Thank you for choosing to stay with Lucky Savannah! The Wilkes House offers true southern charm. We are so glad to hear you enjoyed another stay here in Savannah! We can't wait to see you again soon. This location is a wonderful, quiet place to stay if your looking for relaxation. In the heart of the historical district and so close to many good restaurants. The only negative is the parking in Savannah is not tourist friendly. But that is everywhere in Savannah. Home is beautiful. Even though you have upstairs neighbors, apartment was quiet and neighbors friendly. Walked everywhere. Convenient location close to Forsythe park and many small shops & restaurants. Much less busy than areas closer to River street. Thank you for choosing to stay with Lucky Savannah! 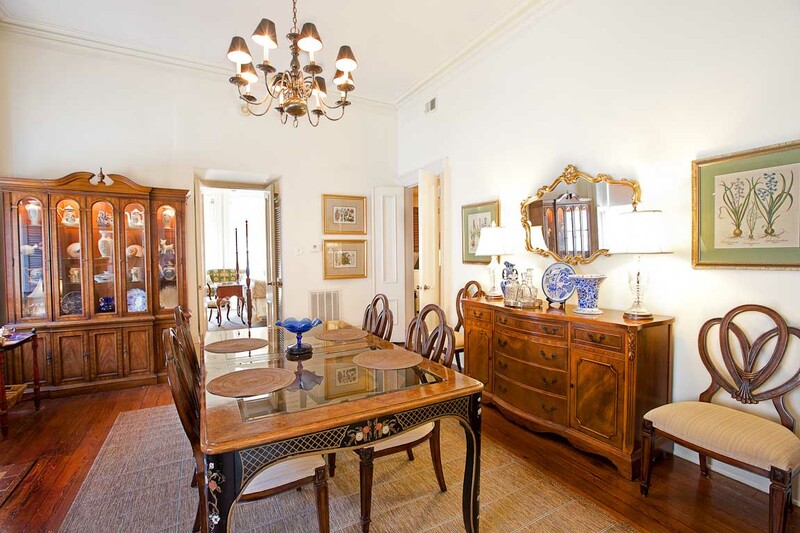 Wilkes Pied-a-terre is a great home, right above the famous Mrs. Wilkes. We are so glad you all enjoyed the home, and the location of the home. The location is very residential, quiet and quaint! We hope to have you all again soon. Perfect place to stay in Savannah! This was one of our favorite vacations. Wilkes Pied-à-terre was beautifully decorated, very spacious and comfortable. It couldn't have been in a better location. We felt perfectly safe walking in the neighborhood at night. In fact evenings were our favorite time to stroll through the squares. We parked our car and walked everywhere. It was our home away from home for our 5 day stay in Savannah. We plan to return to Savannah and would definitely stay here if it is available. The property was just as describe - even better! Loved eating at Mrs. Wilkes downstairs. Some other good eats were obtained at The Grey, Chive, The Pink House (lower level by the bar), the Gryphon. There is so much to do and see in Savannah. We loved the museums especially The Jepson Center and Telfair Museum. Thank you for choosing to stay with Lucky Savannah! We are ecstatic that this was one of your favorite vacations. We try our hardest to make sure all of our guests have a wonderful stay! The owner of Wilkes-Pied-a-terre will appreciate the kind, honest words. We are thrilled you all had a wonderful time here and can't wait to see you all again soon. Please don't forget about our 10% "Returning Guest" discount! wonderful, except for parking. We came in late from site seeing and it was pouring rain, there was no parking on w. Jones so we parked around the corner and got a sweeping ticket. It was a delightful place to stay. It is close to everything. We walked everywhere we went. Then place was as described spacious and clean. My only negative was the water. Very bad tasting. High sulphur content. So we walked to the CVS and bought bottled water to brush your teeth, make oatmeal, coffee, etc. we loved the many wonderful restaurants close by. Mrs. Wilkes of course,the olde pink house, goose feathers, Bella Napoli, to tondees tavern and the cotton exchange were all enjoyed by us. Yes we will definitely recommend it to friends. 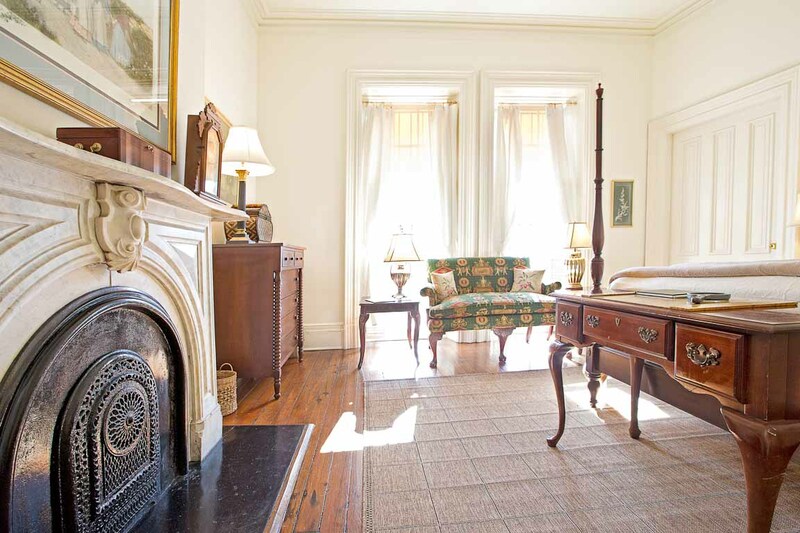 This rental is in the perfect location when visiting historic Savannah. There is so much space. The views are amazing. The bed was super comfy. One of our days was a rainy day so we cuddled up in the living room with wine and watched movies. Super pretty inside too. Very historic with an amazing vibe. Thank you for choosing to stay with Lucky Savannah! 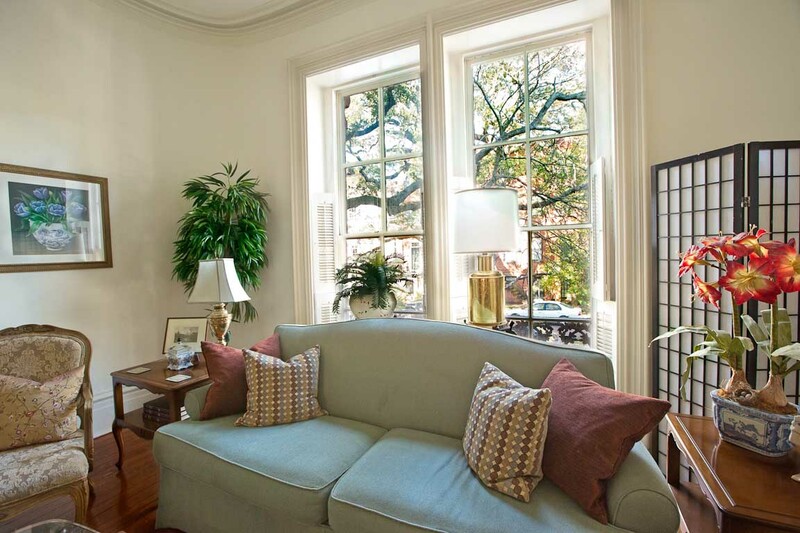 Wilkes Pied-a-terre is a charming home, located on one of the most popular streets here in Savannah, Jones Street. We are thrilled you all had a great time here in Savannah. We hope to host your next Savannah vacation!